Either way, we're here to save the day! Engineers have been known to get stuck at their desk for long periods of time doing CAD Design or electronic design. Sitting down for extended periods of time can definitely take a toll on your health... both physically and emotionally. 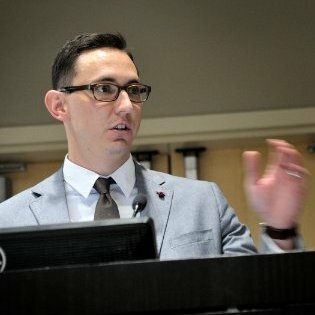 Have back or neck pain? Feel drained or unmotivated during the work day? Are you dealing with weight gain, high blood sugar, or heart problems (or want to prevent these)? A standing desk purchase may be the solution to these and other health problems. Lets take a look at a variety of standing up desks (with various styles and pricing) to help you find the perfect desk for your specific needs. *Full Disclosure: This post contains affiliate links in that if you click through and make a purchase, we will receive a small commission at no added cost to you. This is a very simple and effective desk designed just for laptops. It's also one of the most affordable standing up desks currently on the market. This portable desk is very lightweight and easy to transport. Its legs can Rotate 360 Degrees and Lock in Place at Various Angles. Quickly Collapse The Stand to Make it Portable. It also includes USB powered cooling fans and a designated space for your computer mouse. This option is a little more elaborate than the first. 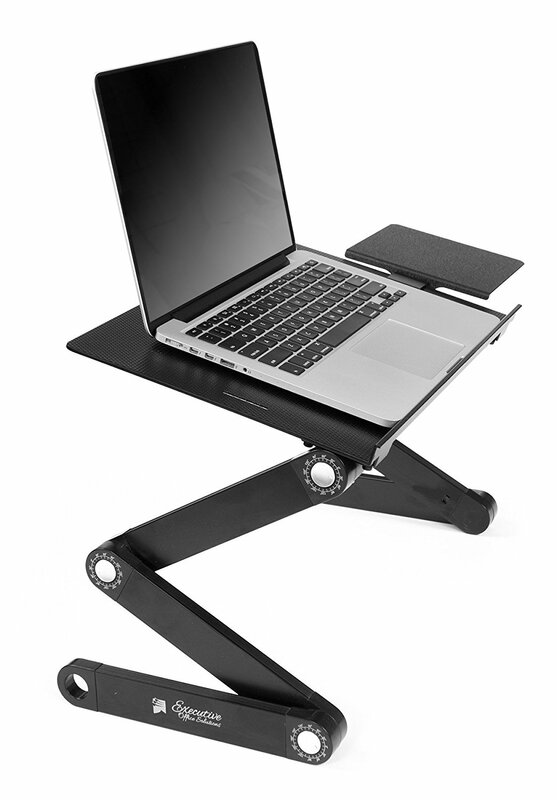 This stand can be used for both laptops and desktops with some designated space for your keyboard. 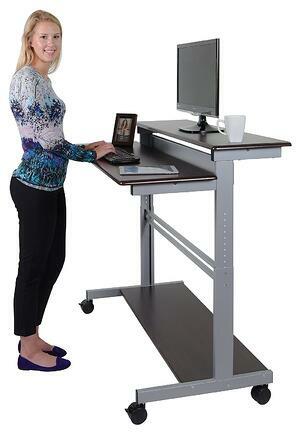 You can choose from 6-16.3 inches at any height as you transition between sitting and standing throughout the day. This is another one of the more simple but affordable options on the market today. 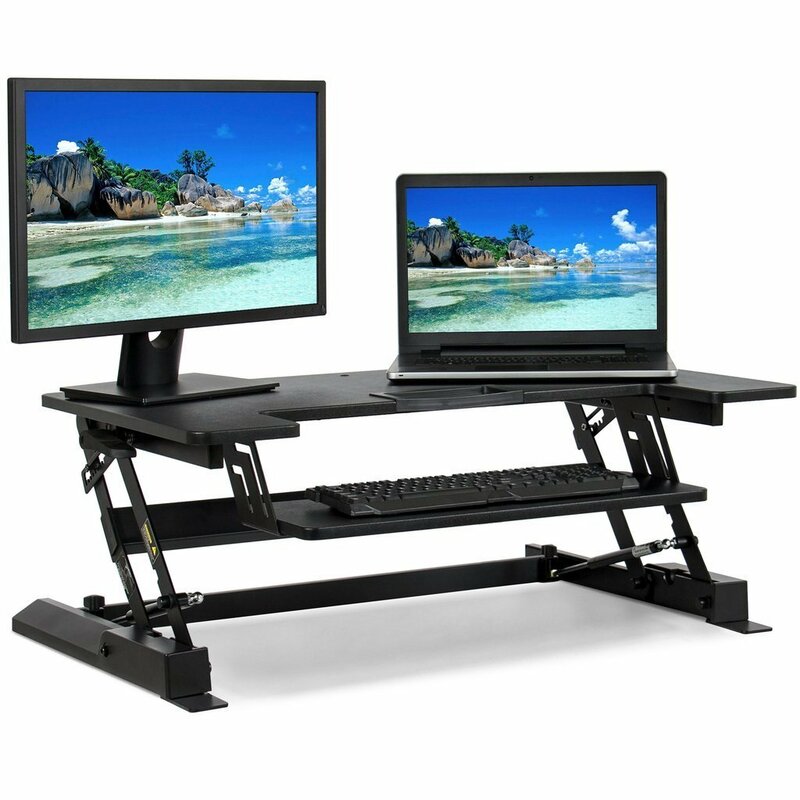 If you're looking for a bigger workstation area, this may be a great option for you. With simple, adjustable sit-to-stand capabilities of up to 16.5 inches, This option will give you the perfect height and space for multitasking. 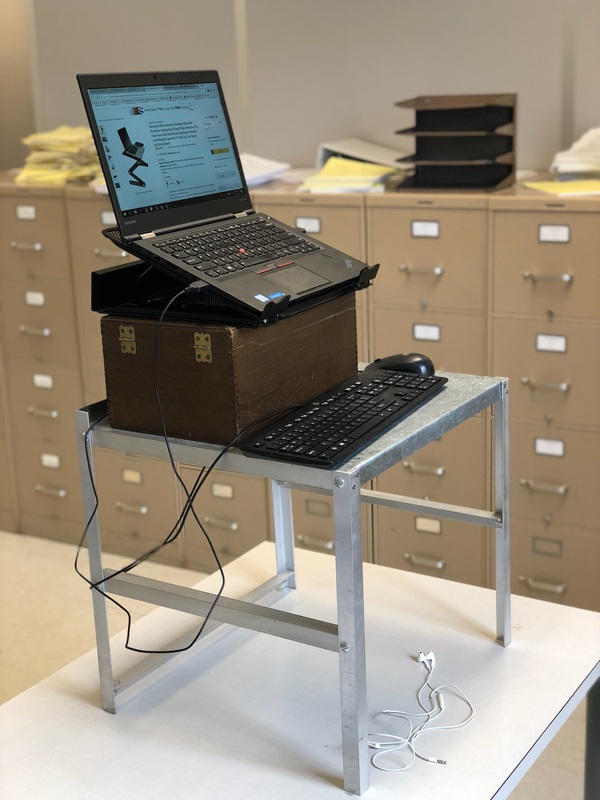 This stand up desk weighs 48 lbs, so if portability is a big concern for you, the first 2 options may be a better fit. 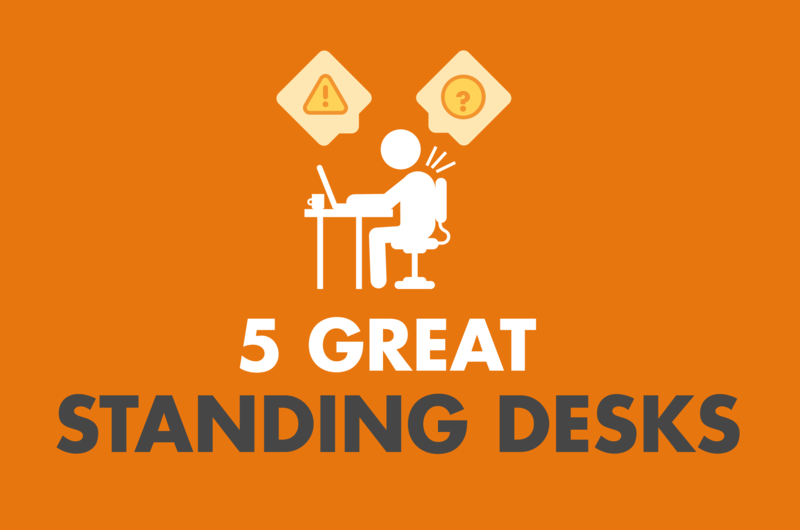 The Veridesk is at the top of the food chain when it comes to standing up desks. 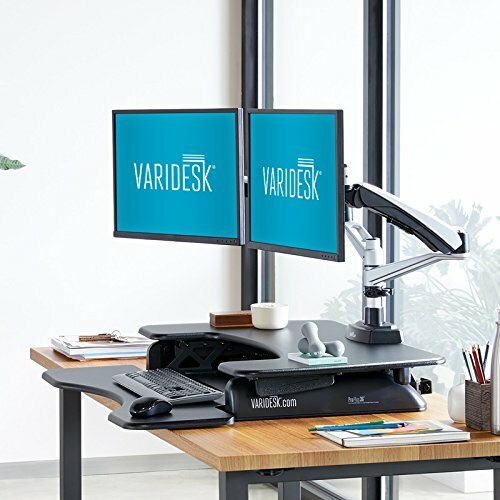 The Veridesk offers probably the highest quality stand on the market as well as provides one of the largest surface areas plently of space for dual monitors, keyboard, mouse, and other small items like staplers or notebooks. The height is adjustable to 11 different positions for ergonomic comfort. It remains fully sturdy and stable even when fully extended and can easily support up to 35 lbs. The Varidesk can extend up to 17.5 inches, making it a great option for the taller demographic as well. A great feature of the Varidesk is that it comes fully assembled, unlike the other options. 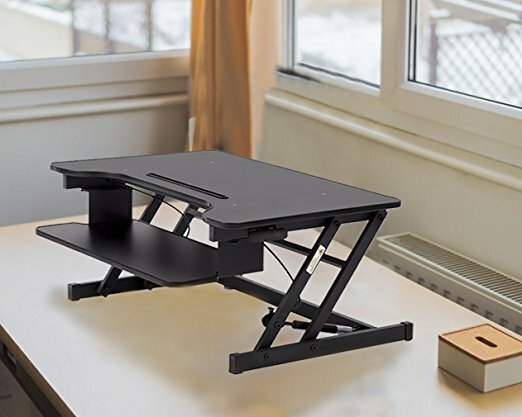 The entire desk by itself weighs about 52 lbs, so it's not great for easy transportation, but if that's not a huge concern...this is a great option! Are you a roamer? Then this may be a good option for you. Feel like working while wondering the hallways? Feel like working near the window today? Or going to visit a co-worker a few doors down to work? Or go grab a cup of coffee without losing a second of precious work time? This workstation allows you to do just that! The desk's shelves have a generous 47.25" wide work surface with a 14" deep top shelf and a 16" deep lower shelf. The shelves have 4.9" of separation; this allows for a unique 2-tiered system that puts your monitor and keyboard at the proper separated viewing and working heights. Everything needed for assembly is included. 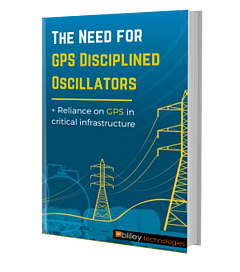 **Bliley Technologies does not claim to be a health expert. Please consult a physician first about any health benefits or concerns related to stand-up desks.